Martha Berry would like to secure Mr. Gribble for Berry. 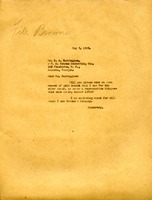 Mr. Leibowitz, or L. Leibowitz and Son Antiques and Mahogany Furniture is requesting Berry pay the remaining amount from her purchase. Mr. Harrington thanks Miss Berry for her kind favor and sends her a piece of damask and some antique nails. chairs, W.E. 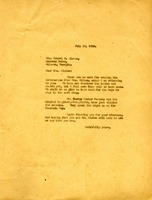 Browne Decorating Co.
Letter from Martha Berry to WE Browne Decorating requesting materials to repair furniture. 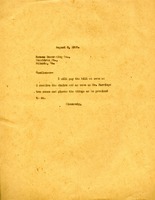 M. A. Harrington informs Miss Berry that her check has been received and that measures have been put into place to complete her order. 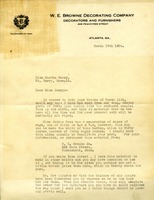 Letter to Browne Decorating Co. from Martha Berry concerning payment for the furniture for the Berry Schools. Miss Berry informs them that she will pay the bill as soon as she receives the chairs and Mr. Harrington comes and places the furniture as he promised her. 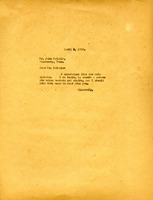 Berry thanks Alston for the information passed on from Mrs. Milton. Berry is excited about the table and chairs the Alstons will be sending, and tells her of George Foster Peabody's visit.